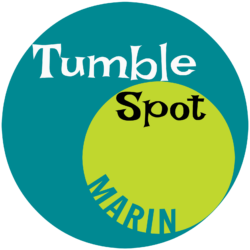 TumbleSpot is the newest place in Marin for children to move and grow! We offer acro, tumbling & gymnastics classes for children ages 12 months – 10 years. Membership is $100/month for one weekly class and continues until canceled (see Policies on our Enroll Page). 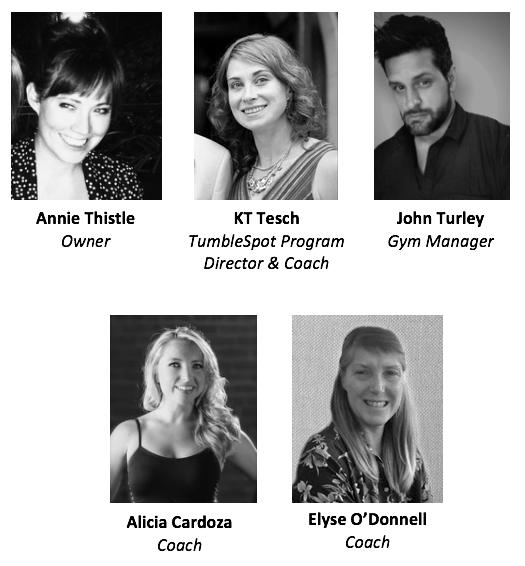 TumbleSpot utilizes a specific curriculum for each age group and class, incorporating foundations, coordination, strength, technique, agility and fun for our young athletes and artists. See Schedule Page for class times. See our TumbleSpot Welcome Letter for information including class schedules, calendars and policies. 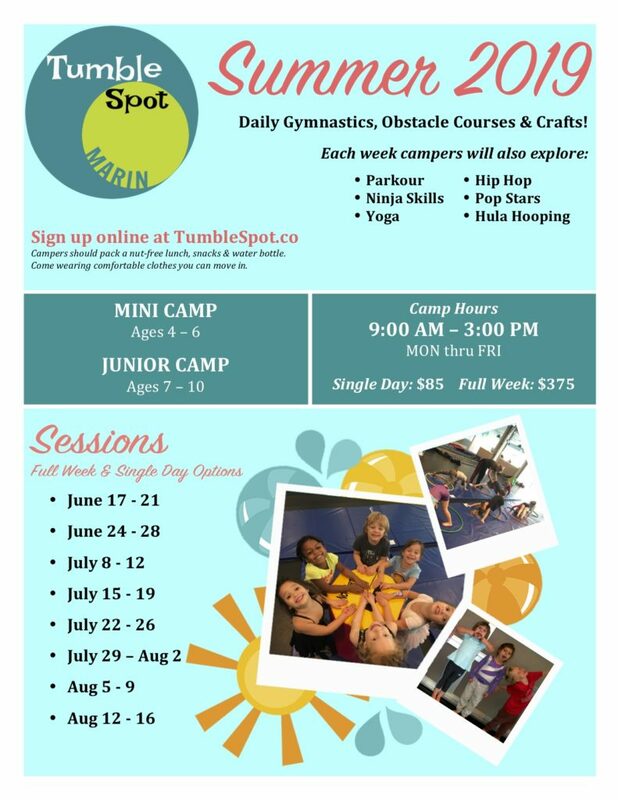 TumbleSpot Summer Camps are here! Check out our promo video, filmed at PAAM! TumbleSpot is open and accepting enrollments. We are tumbling now – complete with training apparatus not featured in video. 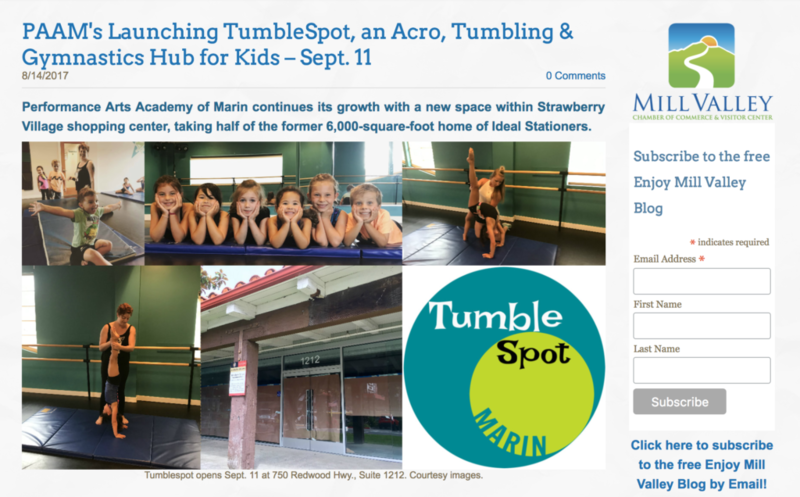 TumbleSpot is the newest place in Marin for children to move and grow! We offer acro, tumbling & gymnastics classes for children ages 12 months – 10 years. Membership is $100 per month for one weekly class. Membership will continue until cancelled – Please see our ENROLL page for policy details. 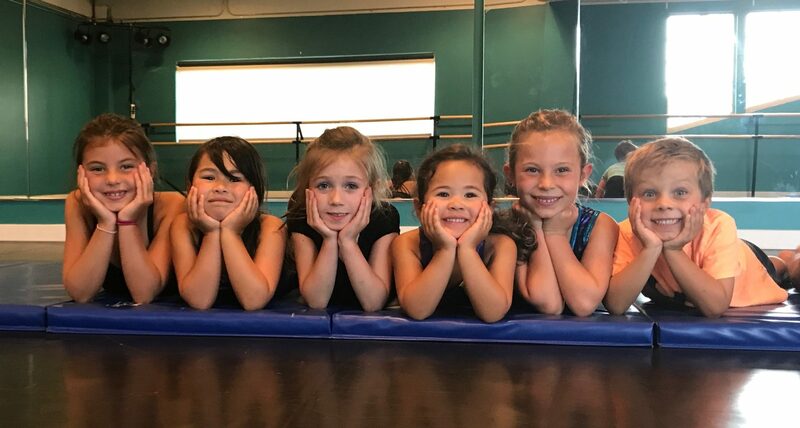 TumbleSpot utilizes a specific curriculum for each age group and class, incorporating foundations, coordination, strength, technique, agility and fun for our young athletes and artists. See our TumbleSpot Welcome Letter for more information. Please bring a water bottle with you to class. There is a filtered FloWater station on-site, but we do not have a water fountain to drink from directly. Water bottles must have a top to prevent spilling. Open containers are not allowed on the studio floor. Cubbies are available in the lobby to store personal items during class. TumbleSpot is not responsible for any lost or stolen items. Street shoes are not allowed on the studio floor. Shoes must be removed before entering class. Only enrolled students are allowed on the studio floor, and only during their scheduled class. Parents, guardians and other non-enrolled family members must remain in the lobby. All classes, with the exception of Supernovas, Babynovas and Open Gyms, are drop-off. Parents/guardians are welcome to wait in the lobby, but are not required to remain on-site. Pick-up is promptly when class ends. Studio equipment must not be touched without the direct supervision and instruction of a TumbleSpot employee. Any equipment damaged due to unauthorized use will be billed to the client. Bare feet and clothes you can move easily in. A leotard may be worn if desired. Hair must be secured back. For safety reasons, students may not wear skirts, dresses, loose or baggy clothing. Check out our feature on the Enjoy Mill Valley Blog. Thanks MV Chamber of Commerce and Jim Welte!